The 73rd season of the National Basketball Association (NBA) has long been started. NBA fans from all over the world are dying to get their hands on a guide that can help them watch all the thrilling seasons of NBA online from anywhere. If you are traveling somewhere outside the US or Canada and don’t want to miss out on the electrifying moments, we have good news for you. 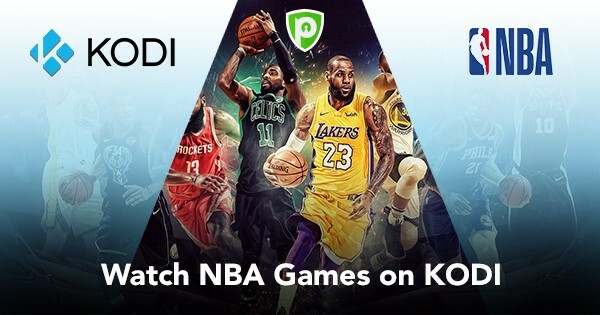 You can check out the following guide on how to watch NBA on Kodi via the best NBA add-ons and catch all the seasons live from anywhere in the world. We will further discuss some of the top official and third-party NBA Kodi add-ons and how to install them. So, without further ado, let’s get started. PureVPN is built to ease all your streaming-related problems even when it comes to streaming on Kodi. Our 2,000+ VPN servers and 300,000+ IPs are available to you round-the-clock, so you get to watch your favorite sports and entertainment at crazy-fast speeds, and the while keeping your identity anonymous. Set up our trustworthy VPN to spoof your location, make your internet traffic anonymous and, thus, access all the popular Kodi add-ons without worrying about country restrictions. Apart from circumventing content restrictions, you can easily ditch ISP throttling to enjoy buffer-free streaming. Connect to the US server for the best streaming experience. Watch NBA on Kodi live on any device and from anywhere. Kodi has an extensive range of repositories and add-ons available for users. The add-ons are usually categorized into official and third-party. The official add-ons offer official streaming options. However, most of the official add-ons need subscription to watch the live content such as NBA sports. Third-party add-ons, on the other hand, mostly provide free streaming options. We’ve scoured Kodi’s official and un-official add-on gallery to list the most popular add-ons. Let’s take a quick look at them. If you have the league pass subscription, you can easily catch most of the regular NBA seasons through this add-on. Since it is an official add-on, you can find it in Kodi’s default repository and install it with a few clicks (more on it later). The problem with the NBA league pass is that it might experience a blackout if the event is being broadcasted on a local channel. Moreover, people living outside the US might not be able to connect to it due to location restrictions. Another official add-on, Sportsnet requires a premium subscription which starts at $24.99 per month. The add-on is associated with a Canadian network and, thus, it has the broadcasting license for up to 40 regular NBA seasons. For sports fanatics, Sportsnet Now might come as a holy grail because it offers a good number of NHL matches, MLB as well as Premier League games. Once you install the add-on, you only need to add your Sportsnet Now credentials to get started. ESPN player is also a potential contender in the add-ons list as it offers both on-demand and live streaming feature. The subscription starts at $10 per month. However, if you need only a one-day pass, you can get it for $7. USTV Now has some of the biggest libraries of sports when it comes to sports add-ons. The add-on offers up to 7 free sports channels. However, if you are interested in more channels, you can unlock 29 more channels for $19.99. On USTV Now add-on, you can catch all the sports broadcasted on ESPN as well as ABC network. Popcorn TV is a widely-popular add-on that provides users with a treasure trove of online content such as on-demand movies, TV shows, sports, live channels and more. Luckily, you can also catch Live NBA sports streaming on the add-on for free. The add-on boasts a heavy volume of content from various countries, especially the US and the UK. It offers completely free streaming options, including sports streaming. The add-on frequently switches repositories to evade the suspecting eyes of copyright trolls. **Note: You can only install the official add-ons with the aforementioned guidelines. For third-party add-ons, you first need to download and install the repository of the respective add-on. Why Need VPN to Watch NBA on Kodi? Kodi is a user-friendly entertainment hub. It provides users with a one-stop solution to stream a wide-range of content, be it sports, movies, documentaries and even live channels. The application is powered by add-ons, which are available inside repositories. The downside is that not every add-on is available in every region. Secondly, some popular add-ons, such as for sports, experience blackout which leaves users infuriated and unable to stream the content. Here, a virtual private network comes as the only tool capable of solving this dreadful problem. With a dynamic range of security and anonymity features such as encryption and anonymous IP addresses, VPN helps users spoof their location and bypass all restrictions. Don’t let any annoying restrictions ruin your NBA matches and events. Pick the right add-on and use our guide to install the add-on and enjoy NBA from anywhere.